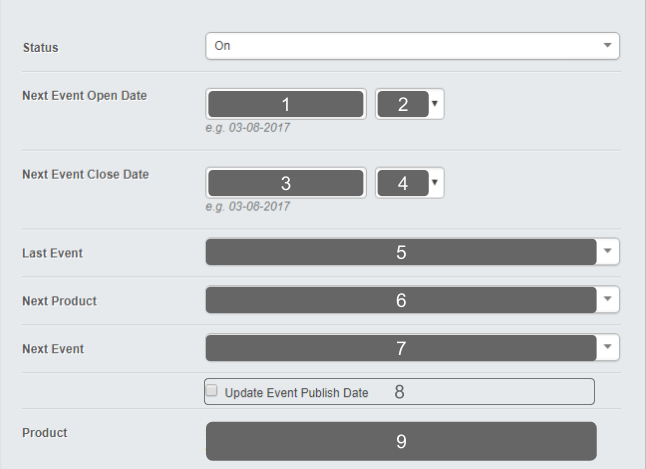 The Product Event Order option within Products allow you to grant access to certain products and events for customers who have already booked and attended another session in your system. Example: Customer A has purchased and attended Course Level 1, you can set up the system, so that Customer A is given access to book onto Course Level 2 before the course is opened to the public. This is done via the Product Event Order tab within a product's settings. Note: Each event can only link to one other event, but multiple events can link to the same product. Click "Add Product Event Order"
The date that the event will become available to these customers. The time that the event will become available to these customers. The date that the event will stop being available to these customers. The time that the event will stop being available to these customers. The event that must have been booked to provide access. What Product is being given access to. What event for this Product is being given access to. The Product that is currently being configured.